(2001/CMusic Books) Author:Stephen McParland This 100+ page glossy coloured coverd book compiles various articles detailing the proposed Jan & Dean film 'Easy Come - Easy Go,' in particular the on-set accident that brought the production to a premature end, including: 'Jan Bery Hurt As Freight Train Hits Crowded Flatcar', 'I Almost Died', Career Nipped In Bud', '15 Of Film Company Hurt in Train Crash At Valley Location'; R&R Star injured in Rail Crash'; 'Singer Tells Of Train Craish On Movie Location'; 'Movieland location Comedy Stunt Sends Singing Star Jan Berry To Hospital Bed'; 'Weird Film Crash', etc. Of significant interest is the inclusion of a copy of the ACTUAL FILM SCRIPTS (dated May 28, 1965). For the first time, fans of Jan Berry and Dean Torrence will at last be privy to what the actual film, - or at least one version of it! - was all about. This is rare collector's find and a MUST HAVE for any real fan of Jan & Dean. Also included are 12 pages of promotional photos of Jan & Dean shot on the acutal film set. 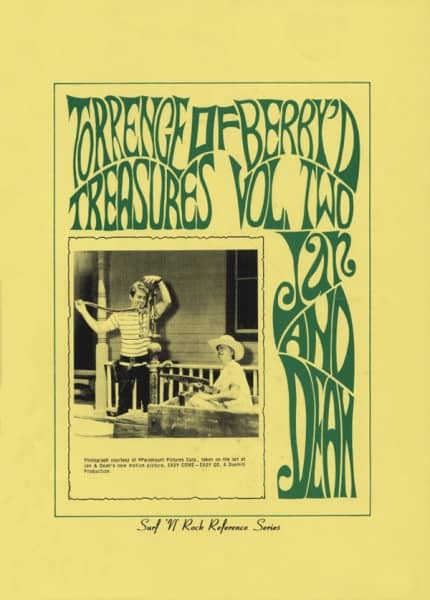 Customer evaluation for "Vol.2, Torrence Of Berry'd Treasures"